O (Observation): Jesus throws out a lot of powerful statements here to show the authority he has. The guards think they have the upper-hand, but then Jesus reverses the scenario when he states that “the Son of Man will be seated at the right hand of the power of God.” Those guards are put in their place; Jesus is the one sitting on the judgment seat. A (Application): Interesting that, today, we make make some very similar claims as Jesus: we are God’s sons and daughters. We don’t feign at this claim. Indeed, we embrace it! As baptized sons and daughters, we are brought into a relationship with God that is grace-filled and unending. Perhaps, some might even consider it blasphemous. Many denominations consider baptism something that marks your faith steps towards God. My belief, however, points us to a God that appreciates our steps forward in faith, but a God who nonetheless knows we will fail…and so steps forward on our behalf. God stepping towards us is the pattern find in Scripture: Noah, Abraham, Isaac, Jacob, David, Jeremiah, Jesus. God moves towards us. And when equipped, we move towards God and towards our neighbors. 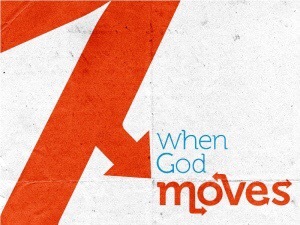 Our God moves towards us. That is grace. P (Prayer): God, give us the umph we need today to move towards our neighbor in love. Amen. This entry was posted in Digging Daily and tagged Jesus, Love, Move, Neighbor, Sanhedrin. Bookmark the permalink. The shortest distance between any two points is zero.